NOW OPEN! 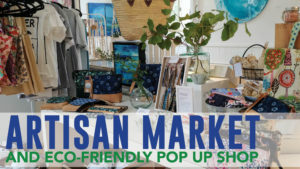 Our pop up shop features local, handmade and unique items for home and gifting. The shop is always transforming and adding new products! Right now, the shop features sustainable and eco-friendly home decor, beauty products and gifts to compliment the H20 for Good exhibition: handmade reusable shopping bags (with cork trim! ), all-natural handmade beauty products, eco-friendly water bottles, recycled glass from Spain, natural hand-dyed clothing, handmade macrame plant holders, water-inspired jewellery, Water is Life T-shirts and more! Our collection of Wendy Tancock designed Canadian treasures is also back! Come see what is fresh, new and creative!